Hima Boutique is elegantly designed with a special naturally beautiful all teak hima in which you can find as your sweet home away from home during your stay in the cultural and historical city of ancient Angkor. 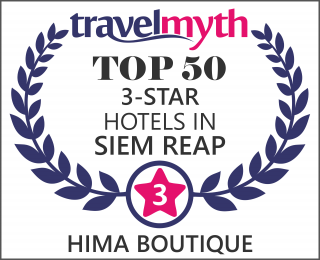 Within 33 mixed traditional hia designated with Boutique facilities room, Hima Boutique experience is about peaceful and stylish relaxation, boutique comfort, and the enjoyment a range of activities beyond the discovery of the incredible Temples of Angkor. Rooms come with its own unique design and decoration. Safety locker are existed in each room and has private balcony and window with quiet, relaxing and nice surrounding views. All rooms are covered with handmade timber floor and wall, and decorated with traditional yet elegant furnishings in different colors and style. Safety locker are existed in each room. Family Suite Rooms is covered with handmade timber floor and wall with well-designed furnishings. This room type comes with a connecting door between two Deluxe rooms with two private bathrooms and full amenities make it very convenient if you travel as a family or as a group of friends or students, Safety locker are existed in each room.